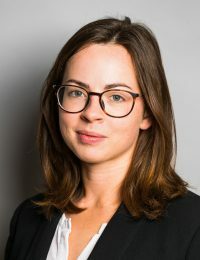 Cara joined Chambers in September 2018 following the successful completion of her pupillage. Her pupil supervisors were Zoë Barton, Jonathan Hilliard QC, Andrew Mold and Julian Greenhill QC. Over the course of her pupillage, Cara gained a wide range of experience across Chambers’ core areas of practice including trusts, pensions, property (including landlord and tenant), associated professional liability and commercial litigation. She has been instructed in her own right, as well as been involved with several trials with her supervisors. Cara is happy to be instructed either on her own or as part of a larger counsel team across the spectrum of commercial chancery work. Prior to joining Chambers, Cara worked at Lloyds Bank in a project group investigating the mis-selling of derivative products, where she handled customer complaints and prepared submissions to the Financial Ombudsman. She was also a research assistant in the field of environmental and planning law, and conducted research for a complaint to the European Commission. Cara studied Law with French Law at University College London and graduated in 2016 with a first class degree. She won numerous academic prizes, including the Dean’s List for overall excellence in her final year and the Richardson Prize for the highest result out of students on the law with language course. She is a Lord Denning scholar at Lincoln’s Inn.